Written at 07:25:54 on Saturday, 9th December, 2017. Being able to find out when a receiver was made is a crucial factor in your decision to buy but also to use as a guide to calculate to a fairly rough degree as to what your whole collection is worth. When I say "rough", I mean exactly that because value can vary not only between receivers but it is the case that no set has a fixed value. For example, there is no document anywhere in the world that will tell you that a Kriesler 'Projectographic' is worth $X. In most cases the value of a vintage receiver is simply what the current market is prepared to pay. Some people pay high amounts of money for fairly insignificant objects and this raises the value of the item, paying no further consideration to what many would consider important, EG: scarcity, functionality, whether the item works or not, age, looks, colour, materials used, etc. I know where to get cheap rare radios from and so do many other seasoned collectors. Funnily enough it is the same place that a lot of common models go for high prices. Some receiver owners like to test the water by being bold with their prices. Their set may work and look attractive and attaching a high price to such a set may increase the confidence of a customer that they are getting a set that will work for a long time. It's the psychological mentality that car makers use when selling cars. A Holden Commodore currently sells for about $38,000 on the road. A 7 Series BMW sells for about $250,000 on the road. Both cars have room for four passengers and their luggage. Both cars are big. Both cars can break the speed limit and land you in gaol. I once had a job that involved valet parking and I can tell you that European cars aren’t necessarily better cars in any way. In fact, most of them have the ergonomics of a 1920's steam powered tractor. Some people just have to buy the BMW because they will have something that not everyone can afford though - a class society is born. The same principle applies to vintage radio - though not in the same way because there's no snob-element with radio collection. Not that I have seen anyway. If you are selling a radio you have to take a gamble on what people will pay you. If you set an outrageously high price and the set doesn't sell then you'll be forced into lowering the price and this may make your prospective punters think that your wares are not really worth what you were originally asking for them. If you set the price too low you'll get plenty of buyers, perhaps including me, but you won't get a return on your investment. If you either tell a lie or give the wrong information about a set then you are likely to be scarred for life. We can't stop people from putting whatever price they like on a set but we can certainly give them, and everyone, a guide on perhaps what that price should be. One thing that should definitely be considered when buying is when the receiver was made. Size of the dial glass. Number of pins on the valves. 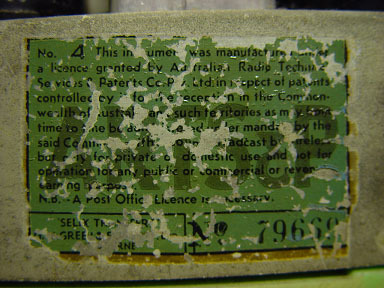 Serial number on the licence transfer. Material a cabinet is made of. To say the least, some of the above methods are more exacting than others! In the 1920's when radio broadcasting began, most sets were 'sealed' so that only one station could be listened to and you paid a licence fee in return for being able to listen in. If you were caught tampering with a set then you were severely punished as this was against the law. The law also forbade people from building their own sets which circumvented the 'sealed set' system by being able to listen to more than one station. After a couple of years it was found that the 'sealed set' system was a dismal failure and the licencing system was changed to allow people to listen to any station they chose at a given time. It was still against the law to operate a radio receiver without a listener's licence though. All these sets were generally small and running on three or four valves and were listened to through a horn speaker or headphones. Towards the late 1920's there were sets with more valves, typically six to eight, and the cabinets were slightly larger and usually sporting three tuning knobs and a volume control. The cabinets were shaped and styled like coffins and were mostly made of solid wood with a black Bakelite or fibre front panel with the dial labelling engraved or hand-painted on. These sets are the elders of radio history and command the most respect in any collection. These sets were made between 1922 and about 1929. After this the first Bakelite cabinets came on the scene. Wooden cabinets changed from solid wood to plywood with a thin veneer of an attractive grain such as teak or mahogany glued to the surface before finishing. The shape of the cabinets was usually a tombstone, art-deco or cathedral shape. This period also ushered in the humble console floor-standing models. The tuning dial was a wedge-shaped port hole about the size of a postage stamp between 1928 and 1932. After this the tuning dials took on an arched or round style with a diameter of 100mm. The late 1930's and for most of the 1940's there was little change and throughout these years cabinets were very large and the dial glasses were large oblong shaped things which sometimes sported features like layered glass with separate scales on each layer - usually to discern between the MW and SW bands and 'magic eye' tuning indicators. The 1950's ushered in the humble four valve compact mantel receivers. Society now dictated that each household should really have two receivers, one in the lounge/drawing room - usually a floor-standing console with MW and SW bands and a small mantel receiver for the kitchen only receiving the MW band. Mantel radios were usually under-powered things though gave enough performance for the simple job of letting mum listen to music programmes while baking the daily bread. Large radios were still made in the 1950's of course but the mantel sized receivers, along with 'tablegrams' really did dominate the market from this point on. Receivers made during this time were still made of either Bakelite, sometimes in various colours and veneered plywood. Something quite dramatic started to happen in the 1960's. Wood and Bakelite gave way to plastic and this saw the end of the built in character that the older sets had. It just wasn't the same and basic quality and longevity suffered as a result of the change. They were still valve radios and still sounded great but they were not built to last and they didn't have that inspiring awe that allows a wooden or Bakelite receiver to stand with authority in a display. In summarising, the size and shape of a cabinet can be used to date a receiver but usually only to a period of manufacture. A more accurate measure can only be made if one knows a great deal about when sets were released. The tuning dial on a radio is, without exception, the focal point on the front panel of a radio. Manufacturers often went to great lengths to make them as attractive as possible and as a collector I spend time glaring at the dial after I turn a set on as - it is sometimes too irresistible to ignore. In the 1920's there was no such thing as a tuning dial as most of us know. Tuning was often done using several adjustments relying on calibrated scale markings of 1 to 100 which was never indicative of where a station might be located. Making a receiver was a science but tuning it was an artform. After a while, manufacturers listened to people's tales about how difficult tuning a set was and they devised ways to make life a lot easier for listeners. Manufacturers developed their own tuning indicators, using methods many and varied and the chants of 'our indicator is a better system than yours' became part of each manufacturers sales pitch. For the time being though, people saw the real solution as reducing the number of tuning knobs to one. The people won the battle for user-friendliness and the tuning method has changed little to this day. In the late 1920's the tuning dial was a small wedged shaped hole where a disc with graduations marked 1 - 100 was displayed. Sometimes this was backlit but most of the time it wasn't. This made life easy because there was now only one tuning knob. These dials were not exactly dominant though. At the start of the 1930's, tuning dials began to get slightly larger. The wedge shaped hole that I spoke about before gave way to either an arch shaped dial or a round dial, both being about 100mm in diameter. There were a few exceptions such as Breville, who made their dials slightly larger still but 100mm was more or less a benchmark for the time. In these later dials the disc with the dial markings no longer spun around to indicate the station. Instead a pointer, like a hand on a clock did this job. By this time most tuning dials were backlit with a 6.3 volt lamp. If the dial's disc was made of celluloid then it will invariably be burnt by the lamp, though fairly authentic-looking replacements are now made for some of the more common dials. During the 1930's there was a big change on tuning dials - the introduction of station listings. Many countries moved from the 1 - 100 scale to frequencies and it is very common to see an overseas-made receiver to show 5.5 - 16 which meant 550 - 1600kHz tuning scale. Australia had a slightly larger frequency allocation though and most Class A stations (2FC, 3LO, 6WF, etc) could not be tuned on sets made overseas. The Australian MW band started at 530kHz which allowed for these stations. To make life easy, Australia's radio station call signs were printed on all future dials which meant that in some cases the dials had to be made bigger. Originally the Northern Territory used the number 5 as their prefix and the Australian Capital Territory used the 2 prefix but this was changed at some stage. Note how AM stations use two letters and FM stations use three. Of course, FM came along in the 1970's and therefore didn't appear on any valve sets in this country. Knowing all this about station callsigns, you can assume that with Australia being a bloody big country that there would be a lot of radio stations. There is. Even today the Commonwealth allocates a certain number of new broadcasting licences each year and they generally are sold by way of auction and can end up costing more than $100m each. Radio is big business and very competitive though I am not sure we need so many stations. During the 1920's and 1930's, there were very few stations and while they each aimed their programming at local audiences, it was considered normal for interstate audiences to tune in. Some of my sets still pick up interstate stations quite well, all things considered, and given the number of stations we have now it is a bit surprising that it's still achievable. I often tune into Melbourne, Adelaide and Brisbane for a few minutes though most of the AM stations are networked these days so what you hear in Sydney is more or less being broadcast in the other states too. During the very late 1930's and throughout the 1940's radio tuning dials became fairly dominant features on most radios, large and small. Some examples are pictured below and the number of stations amplified the need for such large dials. Typically, the stations in the capital cities were given precedence, followed by all regional stations in a smaller font. Given that in those times, most stations provided their own programming, this convention was a little un-necessary in my view, but it was how things were done in this period. 1945 brought some more changes and radio manufacturers where faced with two challenges for the coming decade. One was to make radios smaller. At the time this was easier said than done. There was no miniaturisation of components taking place and no-one really knew how to do so. It was a new manufacturing technique and took several years to become commonplace. 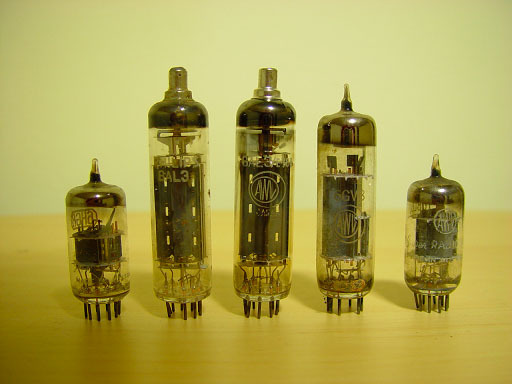 1949 saw the introduction of baseless valves where the pins came directly out of the glass envelope instead of the fragile wires which the base pins were soldered to. Baseless valves were generally faster to manufacture and were also stronger. This was the first sign that miniaturisation would play a big role in radio manufacture during the 1950's. The late 1940's also saw the spawning of the humble small four valve mantel receivers. At first, these were still fitted with GT valves but during, thereabouts 1950-1951, the baseless valves gradually took over which gave the manufacturers the opportunity to install that all-important fifth valve to boost performance. The option was rarely exercised though because these mantel models were always intended to be marketed as second sets because most people had larger radios in their lounge/drawing rooms anyway. Four valve mantels were built to a price though for what they missed in circuitry, they still performed fairly well. 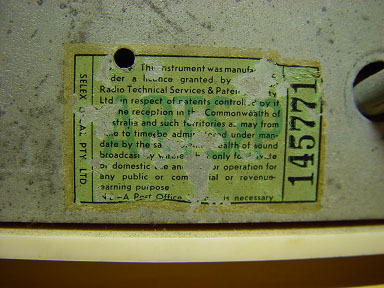 The second challenge for manufacturers was to fit all of Australia's callsigns on the shrinking dials of the 1950's. It was never going to happen. On some sets, stations in small towns were simply left off the dial and it was a case of bad luck. After all, a manufacturer wasn't obliged to mark all stations on their dials - it was simply good practice to do so. A more commonly exercised option though, and probably more favourable to stations, was to regionalise the dials. AWA and Astor are two makers which come to mind straight away because they did just this. Each state had its own dial! Alternatively two states would share a dial, EG: NSW and QLD would be on one, as per the Radiola pictured below, VIC and TAS would be on another and SA and WA would be on the other one. Dials would be simply allocated to receivers on the production line depending on where that batch of sets would get sent. By the way, I didn't forget the NT and the ACT, it's a case of the mainland territories being grouped with NSW and SA respectively in those days. The Astor 'Football' is an example where the set had the slightly more expensive option of a dial for each state and a complete set of six o these receivers would be quite a valuable part of any collection. If your collection had Astor receivers holding a dominant place then it'd be ideal to have six of each dial across all the colours the sets came in and I think there were several colours in limited numbers. You could value such a collection in the tens of thousands I'd imagine because it would be very difficult and time-consuming to collect all possible combinations of dial and colour. So now we know that after a period of grace, splendour and considerable expense and extravagance during the 1940's, radios began to become more conservative in their styling and presence. During the 1950' there was a general shift away from glass as a dial material to thermoplastics and with this came the ability to improve printing technology to a considerable degree. I've cleaned many dial glasses only to clean off the station markings with the dust and cobwebs, so a curse on the inventor of the inks used! This problem is yet to happen to me when cleaning a plastic tuning dial on a 1950's-1960's receiver so this was one of few benefits to come from the adoption of thermoplastics. Because of the ability to print more clearly it was possible to once again include all stations on one dial, reducing production costs and allowing one radio to be sold anywhere. In summarising, the size of the tuning dial changed dramatically over the period in which valve radios were manufactured and if you are familiar with the general aspects of what I have mentioned here, you can date any receiver to an accuracy of +-5 years just by looking at it from a distance. It's a simple matter of becoming familiar with the various types and shapes of tuning dials that existed over time. The style and shape of valves changed a fair bit over time. At first, valves looked a bit like light globes in that they had a round glass envelope, some pins on the bottom, usually four, an exhaust tip at the top and a bayonet cap at the bottom so that the valve could be 'screwed' into its socket. The valve type UX 201 comes to mind here and unfortunately I do not have one that I can take a picture of. A short time later the glass envelope was made larger and the pins were made longer so that the bayonet cap could be dispensed with. As per the UV 201, four pins was still the norm for the 1920's and most sets sported six or seven 201's or similar variants with each tuning stage in the receiver having its own tuning knob. NOTE: This photo shows a group of UX 201's which were almost considered an industry standard. There were certainly other types of valve but the 201 was probably the most common by far. It is still quite easy to obtain them too though Australian made ones are extremely hard to find and when they are you can expect them to cost an arm and a leg. Also note how the above valves still had that characteristic light globe shape. This was to change at the start of the 1930's when valves took on what I call 'hips' and the suffix 'G' was added to the type numbers. The shape is really hard to describe though whatever you want to call it, the shape remained the same for the next 15 years until the smaller 'GT' valves appeared. See the next photo for what I mean. The year is 1937 and the Octal based valves come into existence yet the shape of the glass remains much the same as is indicated in the photos above. Note the 'key' on the central stub on the Octal base which makes sure that the evenly spaced pins find their way into the right holes in the socket. Australia was fortunate in a sense that our industry adopted the American valve base patterns instead of the European ones. Europe had so many different types of bases that there may as well have been a different one on each valve type. One such base type is pictured below and is a side-contact type, very popular in British sets but seldom used in this part of the world. NOTE: This valve was extracted from a Kriesler 'Projectographic' receiver from 1938. Why they included this valve among a group of the more traditional four and six pin valves is something we may never find out. Even stranger is that this valve was British when the rest are made in Australia and that the receiver was also made here. In 1949 the first baseless valves started to roll of production lines though Australia's industries were still recovering from a complete shutdown during World War 2, when manufacturing digressed from domestic consumables to making military hardware. Valves, condensers, radio cabinets and chassis gave way to tanks, guns, warships, planes all in the name of defeating Germany. Australia was also the sole allied supplier of telescopic lenses too! Australia did start using the baseless valves from about the middle of 1950 though it was a gradual progression. 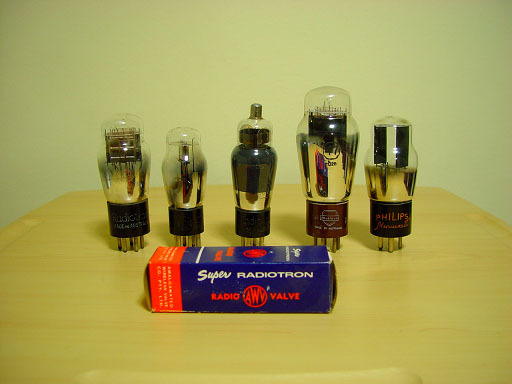 I own many four valve mantel models and a few of them boast a mix of Octal and baseless valves. From about 1952 onwards though, the baseless valves had taken over. They were simply a far better design and for the first time there was a standard base pattern throughout the world. NOTE: All these valves are of the baseless type. They were quite strong too and could take a bump, even being dropped on hard floors and with the pins being directly on the valve instead of connected with delicate wire proved another strong point. These valves remained in force right up until the introduction of transistorised receivers in the 1960's. So it is possible to date most receivers to +-5 years by using the valve line-up, though it has to be taken into consideration that the valve line-up has either been modified or completely replaced at some stage. I have a 1933 console radio, probably a Weldon because it has a Weldon dial, and the 80/47 rectifier and power valve line-up has been replaced with 5Y3G and 6V6G respectively. These latter valves were not made in the early 1930's that is for sure! The other three valves in this brandless set are of the correct type though and along with the Weldon dial, this gives a reasonable indication as to the decade the receiver was made in. "Did you just say licence? ", I hear some people asking. That is quite correct. Back in the first days of radio there was no advertising. The handful (six or so) stations in Australia earned their revenues from a carve-up of licence fees collected from listeners. This system led to the inception of what we now know as the Australian Broadcasting Corporation, EG: Channel 2 Television and I think around four different radio networks, they being (only Sydney callsigns listed here) Radio National (2FC), ABC AM (2BL), Triple J (2JJJ), ABC Classic FM (2ABC, 92.9). Because the ABC developed a marketing department, today known as the ABC Shops, and also from a massive injection of taxpayer funding, the former A Class radio stations no longer required licence fees as a source of revenue and the listener licencing system became outdated. On the 1st of September 1974 radio and television licences were abolished. For the first time you could own and listen to a radio without having to pay for the privilege. 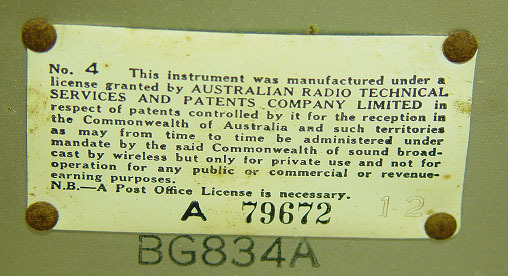 As a reminder that people were required to possess a licence and to remind them about existing patents applying to radio broadcasting there was a special transfer on the back of every single commercially manufactured radio from 1934 right up until abolition in 1974. Over time the appearance changed slightly a few times, as did the material the labels were made from. 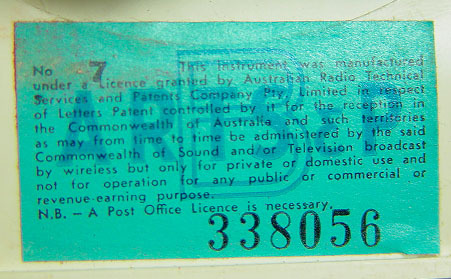 NOTE: This is the first of the licence transfers that would adorn Australian radios for the next forty years. Notice the prefix letter "A", which came to mean that the set was made in 1934. A full table showing letters to years of manufacture follows below. NOTE: From 1935, onwards, the labels were similar to the old car registration labels. They were soaked in water for a moment and then pressed onto the surface and left to dry. This method was cheap and reasonably quick to manufacture and apply to radio chassis'. 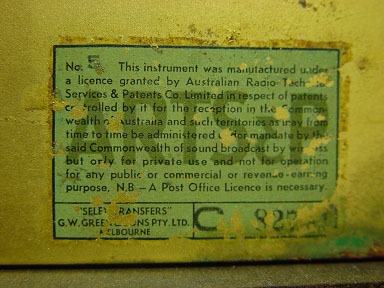 This licence transfer is from a 1936 Weldon console receiver. This date was determined from the prefix letter "C" in the serial number. When the transfers came out, the spelling of the word "licence" was also corrected. NOTE: Gone are the days of the prefix letters. After World War II it was deemed that the year of manufacture could be obtained easily from model numbers, a feature not present in some early sets. Unfortunately it is hard to get hold of a receiver with a licence transfer fully intact. These things are wafer thin and over the years they go brittle and peel off like sunburnt skin. The colour changes from blue to green. The last of the blue labels was also the swansong for the prefix letter on the serial numbers. It is my understanding that the letters G, H and T were used during and after World War II for a short time before the letter disappeared altogether. G indicated 1940 and 1941, H was used on a few sets made during wartime but before manufacturing stopped to aid the war effort. T was used to indicate a 'post-war' receiver though I am yet to see the letters H and T on any receiver. NOTE: In the 1950's the labels got smaller and started to include the words "and Television" to describe the patent information. The above picture is from a 1947 AWA Radiolette, a popular receiver in brown or white though I own a green one so there were a few coloured ones out there too. This model started out with the larger label but the 1950 variant sported the smaller one. The labels got smaller simply because the radios were going much the same way. The 1950's was the decade of the four valve mantel midgets and space was at a premium in most of them. As such, chassis' were rather shallow. 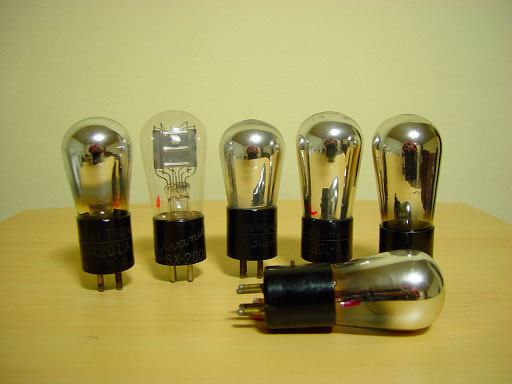 In a successful attempt at economising, manufacturers put five valve versions of these mantel models in their consoles and radiogram models, creating an insanely weird look inside the rear of the cabinets though by this stage it was hard to tell as receivers were generally equipped with back panels, usually made of Masonite, making the economising attempts hard to discover. NOTE: The 1960's brought transistorisation and a timely end to the valve era. In the 1960's there were many changes. Licence labels were made of cardboard and simply glued to the inside of a cabinet which was most likely made of some kind of thermoplastic material instead of the more durable and attractive Bakelite. Transistorisation also became commonplace which meant that radios no longer contained the dangerous voltages of the valve era, except the mains powered ones of course! Looking at the material the cabinet is made of is probably the least accurate way of determining its age. Both wood and Bakelite were used over a period of about 40 years. The very earliy receivers were usually made of solid wood panels with a Bakelite or fibre breadboard inside where the valves and coils were mounted. A few sets from the 1920's had marviplate front panels which was basically a piece of sheet steel or tin which was screen-printed with a false woodgrain while some others, notably those made by Atwater Kent were made of steel in the shape of biscuit tins. Please see the sitemap for pictures of early receivers. 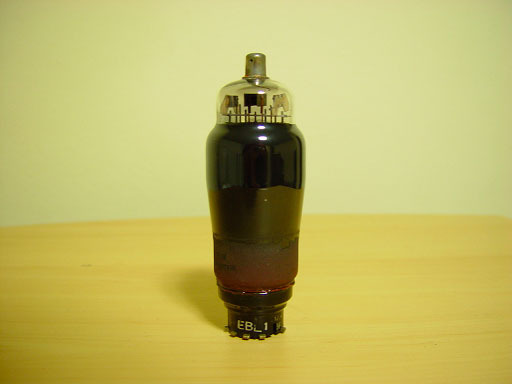 Bakelite, used for cabinet making, was believed to be first used in Australia on an AWA Radiolette model C87 in 1932. The Bakelite was a dark rosewood colour rather than the more common mottled brown that we see so much of and this increased the value of these sets that still exist. Some people put silly prices on them though and they can't possibly sell for such prices. As an example I saw one of these receivers offered on the online auction site, Ebay, for a starting price of $6,500. The set was 'passed in' due to no bids. In good condition the set is probably worth closer to about $1,500 in working order. As far as sentiment goes, $6,500 may be what that set was worth but this isn't a deciding factor in the buyer's mind when looking to add to their collections. From the time the above-mentioned set was made, up to the late 1950's sets were made of either veneer-covered plywood or Bakelite. An elaborate wooden receiver or one of the coloured midgets of the 1950's are the receivers that fetch the big bucks at sales. Coloured Bakelite receivers were usually made only in limited numbers, maybe 500 to 1000 at the most, many models even less than 500. Why manufacturers used veneers instead of solid wood is a mystery to me. While there'd have been a cost saving from using plywood, the manhours burned up on the slow process of veneering cabinets would have easily made up for it. I do concede, however, that a veneered cabinet does look the part. 1922 - Solid wood or pressed steel cabinet, thick fibre or Bakelite breadboard. 1930 - Bakelite or veneered wood cabinet, pressed steel chassis. 1960 - Plastic cabinet, pressed aluminium chassis. 1965 - Plastic cabinet, thin fibre printed circuit board. As has been demonstrated, there are many ways to judge the age of a receiver to at least within a few years of manufacture and in some cases the exact year. If you are in possession of owner's manuals then it is possible to date a receiver to the month it was made. Some people ask: Is age important? The answer is both yes and no, depending on what you are thinking of at the time. The age of a radio doesn't mean a lot if you just want to have an old valve radio to listen to whilst doing some other task or hobby. Valve radios have a mellow but powerful tone that is yet to be emulated in any transistorised receiver. The fact that modern high-end HiFi amplifiers can command very high purchase prices due to their sound quality proves my point here. Valves simply do a better job with the output stages of amplification. If you are a collector or antique dealer then you don't need anyone to tell you that age is extremely important. If you are either displaying radios or selling them, it's imperative to know when it was made. Some antique dealers (but not all of them) either exaggerate a set's age or simply guess through ignorance, usually favouring earlier dates out of convenience in order to get a better price. Because of this you, as a potential buyer, needs to know that the shopkeeper is giving you the right information. It is your right to dispute the age if they quote it incorrectly, though I have to say, through experience, it is often a waste of time because the dealer will insist they are right as most of them are older than the buyers and are therefore supposedly in a better position to know the age of a set. In fairness to the trade though, I do know a lot of antique dealers that do discount radios because they don't know much about them and don't want to be challenged on details offered about a set or that they'd prefer to shift stock more quickly to keep customers coming back. It is these people I prefer to deal with when buying and selling. At the other end of the scale I see radios on shelves that have been there almost the whole time I have been collecting radios and that is a shame. A valuable vintage radio receiver on an antique dealers shelf lies there unappreciated and lost in time rather than being in a collector's realm, dusted weekly and played about as often or more. There are 7 visitors on Vintage Radio now.